April 2018. Our friends Philip and Cathy recently hosted another dinner, an evening of fine food and wine. It’s seldom that fewer than 8- 10 bottles are broached on these occasions, and all are tasted blind. The latest get-together took this form: As aperitif, a 1990 Riesling Rauenthaler Baiken Spatlese. Bigger than most Spatlesen, close to an Auslese in weight and body, it was medium dry (10.5 ABV) and smelled like apricot with a hint of barley sugar. The ample Riesling fruit was balanced by fine orangey acidity. Fine on its own, off-dry rather than sweet, it could easily have accompanied a fish dish too. 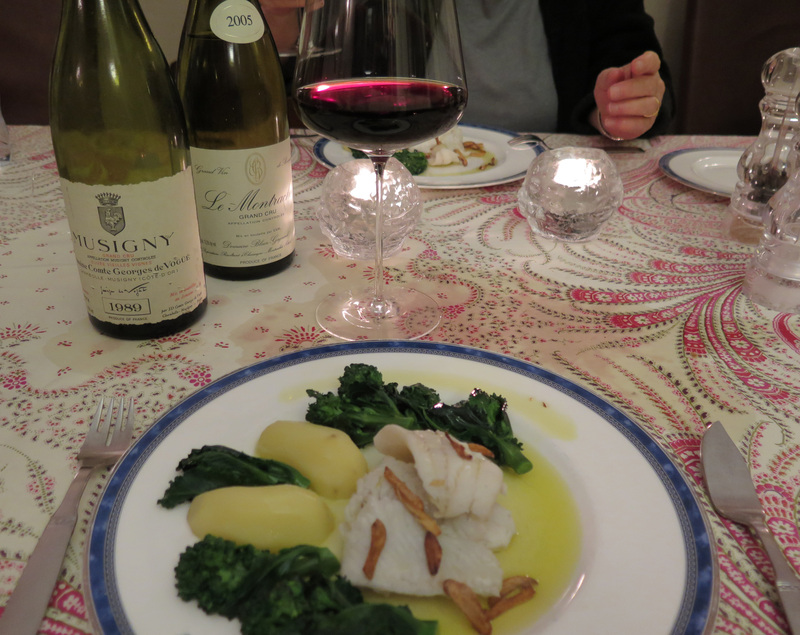 However that role (to partner a halibut steak) was performed by a fully mature 2008 Puligny Champ Canet from Sauzet. Though more evolved than might be expected, that was to our advantage on the night, as it was round, full-flavoured, and mineral. There was an assertive, earthy quality to it that had me thinking, initially, of white Rhône (the two can be surprisingly similar when mature). Soon, however, its burgundian character became clear – after 20 minutes or so! The first red – 1994 Rioja Faustino Gran Reserva – shot out of the glass like a rocket. Very dark, intensely aromatic, it went through several phases in the course of an hour (I kept some in my glass so as to follow its progress). It worked extremely well with the roast lamb that was the evening’s main dish. It was so sinewy, so vital, it made me think of a great athlete in mid-leap – temporarily off-balance but containing all the elements needed for a safe and sure landing on its feet. Though still short of full maturity, it worked extremely well with the meat. One of my favourite reds was the 1998 Vieux Télégraphe. I didn’t identify Châteauneuf straight away, as the wine was so deliciously mellow (you could hardly feel the alcohol) it could almost have passed for a Burgundy. Yet, au fond, it didn’t have true Pinot Noir character – though did show a comparable finesse. A lovely wine, succulent without oiliness, with a kind of ripe-grape sweetness that had you smacking your lips, avid for more. The 2005 Clos Vougeot Vieilles Vignes from Château de la Tour soon compelled our full attention. Unmistakeably a great and complex wine, it showed a special kind of weight and terroir character. It had all of the classic Pinot Noir traits – subtlety, delicacy, intensity, finesse – yet somehow could not be identified as such straight away. Why? Because the vineyard’s unique character overrode its varietal personality. A magnificent wine that will go on improving for decades. A ’97 Amarone from Allaguni showed true Italian character – firm acidity, full body, assertive fruit with an element of wildness to it. It was round and cushiony – almost porty in fact – with the kind of sweetness you find in a home-made plum jam. Dosing 15 ABV, it was impressive but just a shade too rich to be an ideal partner to the lamb. Also impressive was the 1970 Château Léoville Las Cases. Dark and weighty, with classic Médoc personality, it was vinous and forceful but a bit ascerbic on the finish – a trait I find in many 1970s. Years ago, in the Médoc to taste some 1985s, I had a chat with Jean-Michel Cazes of Château Lynch-Bages, who the previous evening had travelled into Bordeaux to a huge retrospective tasting of 1970 clarets. “What was your overall impression?” I asked him. “Severity,” he replied, with a slight grimace. I have found that very quality in quite a few 1970s over the years, not least a Latour (oddly, the same wine in magnum was one of the greatest clarets I’ve ever tasted!). Among better 1970s was one uncorked on an earlier occasion by Philip: ’70 Giscours, a really beautiful wine: silky, profound, and long. A ’70 Petrus, opened by David Matthews, was also memorable, if less sumptuous than usual. ’70 Ducru Beaucaillou was also very good, though a bottle sampled a few months ago seemed to be in decline. Two Grand Cru Burgundies, one red, one white. Both go extremely well with the turbot that’s just out of the sea (20 metres away). Back to Philip & Cathy: best red of the evening, to my mind, was the 1982 Château Lynch Bages, a wine that fused grace, subtlety, power, and persistence. The dessert wine, too, was memorable: a half-bottle 2008 Pinot Gris Vendange Tardive from Domaine Weinbach. Close to an S.G.N. (Selection de Grains Nobles), in terms of concentration and honeyed sweetness, it was light yet full of energy, showing a blend of precision and delicacy that made me think of a silverpoint by Leonardo. It filled the mouth with concentrated Pinot Gris fruit (apricot, honey, pineapple) yet remained as light as a feather. It was spectacularly long, in fact 40 minutes long – the time its aftertaste stayed with us on the journey home. It was my birthday recently and I held a dinner with some wine-loving friends. The food: foie gras mi-cuit with raw mushrooms and micro-thin shavings of orange and lemon peel; superb roast beef with a potato gratin; cheeses; and a delicious almond-and-pear cake. I’m always a bit worried when serving older wines – you never know how they will perform – but all showed beautifully: 2002 Dom Pérignon, 2005 Le Montrachet from Blain-Gagnard (rich, concentrated, and inspiring), 2015 Charmes Chambertin from Domaine Dujac (absolutely wonderful, in a passing youthful phase of exuberance ); 1964 Léoville Las Cases (truly magnificent); 1990 Chambertin Clos de Bèze from Rousseau (a treasure-chest of exquisite perfumes and flavours); 2005 Hermitage les Bessards from Delas (dark, forceful, and splendid with the cheeses), and a 2001 Gewurztraminer S.G.N. from Trimbach (on a level with the finest of Sauternes). Most of these bottles were bought years ago, at modest prices – about 5% of what they would cost today. The Las Cases was from a magnum. 1964 was difficult year in the Médoc. Only châteaux that harvested before the torrential October rains came up with anything really good. Latour did so, deliberately. Las Cases was one that picked early – but not because of a balanced judgment of vintage conditions. Over a lunch at the Château at which that very wine was served, (as well as the ’61 and ’59), the late owner Michel Delon drily explained to me why. “My father always harvested early – usually far too early. And because he harvested on that customary early date in ’64 he made an excellent wine – by pure chance! I’m just back from Paris, where I was inspired and uplifted by one restaurant meal there; a bit disappointed by another; and much disappointed by a third. Gaya Rive Gauche enjoys one Michelin star. We went there because it’s described in the Michelin guide as a fish restaurant (I favour seafood after a heavy day’s activity), and also because it’s owned by three-star chef Pierre Gagnaire. Surely a guarantee of excellence. One of its specialities is oysters. What excited my interest was that their supplier was mentioned by name on their website. In addition, as Gaya is under the imprimatur of the near-legendary Pierre Gagnaire, the place surely had to be outstanding, and its oysters of the very highest quality. However, on looking at the menu we found no mention of oysters. That was odd, given that they seemed to take pride in their source of those (sometimes) sublime molluscs. Surprised at the omission, I asked if they actually had any oysters. So we ordered some. In a word, they were not very good. Salty, sunken, without minerality. The main dish – scallops with Gorgonzola sauce – gave little pleasure either, the sauce being cheesy in an unattractively sweaty way, the scallops – perhaps the most delicate of shellfish – over-seared. And the bill over-expensive. One talks of absentee landlords; what about absentee master-chefs? The frequent result? What I call Madame Tussauds cooking: waxwork replicas of the originals. At restaurant Helen – another fish specialist – we had a decent dinner. A sea-urchin dish was fine, likewise a sautéed John Dory and a delicate langoustine creation. My own main course, however – grilled sole – was disappointing. I love grilled sole – firm but succulent flesh lacquered with a lightly caramelized surface. What I got were grey, flaccid fillets, with a somewhat neutral flavour. The wines, served by their very professional sommelière, were fine: a 2014 Saint Bris Sauvignon from De Moor (a good producer based in Chablis) and a delightful 2014 Fleurie. The high point of the whole two-day stay in Paris was lunch at l’Epicure, at the de luxe Hotel Bristol. The cost of rooms there is way beyond my budget and meals at their three-star Epicure restaurant are expensive too. But for reasons soon to emerge, the outlay at the latter was well worth the cost. Those who truly appreciate cooking at the very highest level, who see gastronomic perfection as meriting at least as big an outlay as, say, a pop concert or good seats at a first-division football match, will know what I mean. What we had was a beautifully cadenced, three hour demonstration of gastronomic mastery. An integral part of this was the skill and prowess of the serving staff. Watching them in action was to witness teamwork of the highest order – as with a team of acrobats or a corps de ballet. A whole series of dishes, most of them tiny and as visually pleasing as bits of Faberge jewellery, arrived at precisely judged intervals. There was nothing contrived or artificial about their presentation, no attempt made to make the ingredients look like something they were not. Here, the cooking brings out and accentuates the natural flavours of every single component. This was one of the finest meals I’ve ever eaten. Several amuses-bouches, simple in concept, intricate in execution: an exquisite sea urchin dish; delicious stuffed macaroni with black truffle and foie gras; cod with winkles ; langoustines served in a celestial broth; and much else. Not one single item was a letdown. The wine list was thicker and heavier than a telephone directory. But prices were dauntingly high. With only a few moments in which to make a decision, I ran through it at lightning speed. By pure luck I found two lovely wines that were both affordable and eminently drinkable: an old-vine white Côtes de Catalanes from Clos des Fées and an unforgettable bottle of 2010 red Côtes du Rhône from Château des Tours. The latter was fashioned by Emmanuel Reynaud, the man who makes Château Rayas, one of the world’s greatest wines.